Happy New Year! New blog and updated website! Happy New Year :) I wish all of you the very best in the new year. Be sure to bookmark the new blog or subscribe to the RSS feeder. I will no longer be posting on this blog. Thanks to all you faithful blog readers. I hope you enjoy the new one! Where have I been? I usually blog a lot more often than I have been lately. In mid-November I flew back east to spend time with my mom, who as many of you know has been battling cancer. The past month has been completely dedicated to caring for and spending time with my mom and I am so thankful to be able to have the time and flexibility to do this. A few weeks ago our local newspaper here in Pennsylvania was looking for locals to submit a favorite holiday memory. Our good family friend Mary submitted a story from nearly two decades ago, and the newspaper contacted her to tell her that her story had been selected to be featured in the newspaper. A reporter came by last week to ask her some follow up questions. This morning Mary stopped by to visit my mom, and to our surprise and delight her story was featured on the FRONT PAGE of the newspaper! This holiday memory is a great example of the kind of sweet, thoughtful people both of my parents are. Please take a minute to check it out on the newspapers website here. 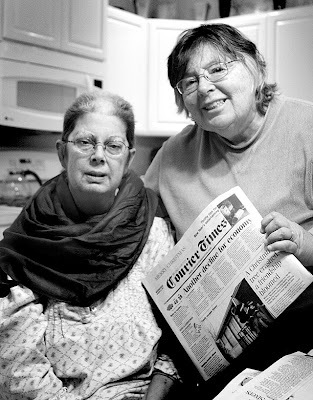 Here are some quick snapshots of my mom and Mary and the newspaper from this morning wearing the pashmina Mary got for her. My family moved to Newtown Twp. from New York in 1990, and our family got friendly with our neighbors, Donna and Joe and their children, Ryan and Ashley, fellow New Yorkers, also far from family and getting to know Pennsylvania. Our family put up a too large Christmas tree a few days before Christmas, and during its first night up it tipped over and all of the needles fell off, and we were looking at a skeleton of a tree. We went back to Carousel Garden and they gave us a replacement tree the afternoon of Christmas Eve, and this one crashed over sending ornaments in every direction, breaking many of the glass balls. Our children were still very young, so I tried hard to make light of it, saying it didn't matter, we'd decorate the little orange tree in the family room and Santa would put the presents under that tree. It really should not have mattered; we were together, we were in a beautiful new home, and we would be visited by Santa. Donna and Joe, along with a few other of the neighbors, all new to Newtown, Pennsylvania, living in a new development, all came to our treeless house on Christmas Eve to visit and have a little party. We told the story of the falling Christmas trees as if it were a big joke, getting a lot of laughs. The party broke up and everyone went home, and children were sent to bed, and outdoor Christmas lights were extinguished. We cleaned up the remains of the little party and were busy into helping Santa put presents under our little orange tree well after midnight, when I heard very light tapping on our front door. When I opened the door, in my memory, snow was gently falling, but whether it was or not, or whether that is the coloring of years of a favorite memory I am not sure. But standing on our front stoop in red striped night shirts and fur coats, were Donna and Joe, holding an artificial, three foot tall, lighted Christmas tree, so "Santa will find your children", as Donna said. I am particularly sentimental this year about that story. All of the children who were at our Christmas party have grown up into wonderful adults. Donna and Joe are no longer married, and Donna, with the love and support of her friends from Newtown and her children and new husband, is battling a very aggressive cancer. As I visit her to at least try to keep her company as she suffers through this terrible illness, I remind her often of this first Newtown Christmas, and what it meant to me to know that my new friends would be good friends to me forever. Again, I am so thankful to be able to spend this holiday season with my mom, family, and so many wonderful friends who have been so supportive through this ordeal. I hope you all have a fabulous holiday season and a wonderful new year. My favorite holiday of the year! Happy Thanksgiving to you all! This year I am MOST thankful that my mom was released from the hospital today in time for Thanksgiving tomorrow! I am thankful my mom has good health insurance! 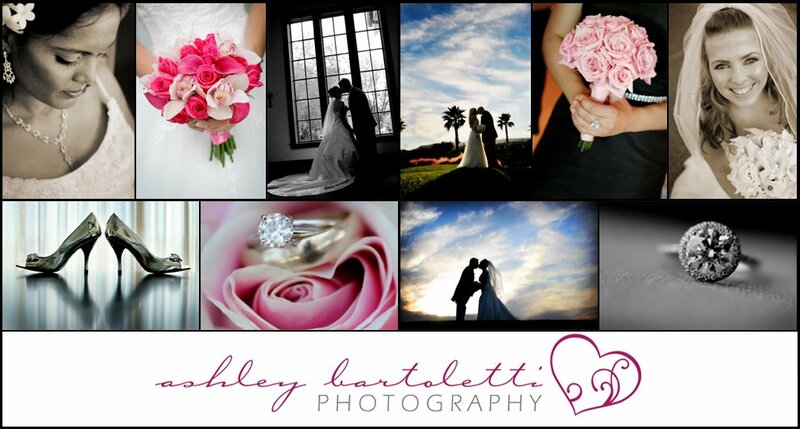 And of course, I am thankful for all of you clients who put your trust in me to capture your precious memories. Happy Holidays to all of you and your families!!! Last weekend I headed out to one of my favorite places, Santa Barbara CA, to second shoot with fabulous Orange County wedding photographer DrewB (accomplishing #13 on my 101 things to do list, second shoot with a photographer I admire). After a fire broke out in Montecito two days before the wedding, I was really nervous it was going to cause problems with the wedding. Thankfully, everything went off without a hitch! The wedding was GORGEOUS. We started off at Fess Parker's Double Tree Resort right on the ocean, then headed to the Montceito Country Club for the ceremony and reception. There were some fabulous moments during their ceremony. Could Carlos look any happier? During the ceremony Carlos's sister did a reading, and couldn't hold back the tears. Love that! Listening to the officiant, I love the look on Jen's face here. So happy and peaceful. LOVE this, they look soooo happy!! We were blessed with some beautiful light! My email is being strange... emails are taking a day or even a few days to show up in my inbox. Please be patient as I work out this issue, or try my at photogeek103@gmail.com or by phone. Favorite! How cute is she?? Congrats guys! Keira is beautiful!! More words to come. For now. the pictures!